In almost every area of our lives, today’s economy has made a major shift towards the world of ecology, going green and eco-friendly. Consumers are emphasizing an eco-lifestyle and companies are investing in everything from renewable sources of energy to completely ecologically safe products. Cities, counties, and entire states in the U.S. and around the globe are focused on reversing global warming. In this environment it comes as no surprise that there is a walk-of-shame for states in the U.S. that are listed as the ‘least green’. In 2011, the organization 24/7 Wallstreet analyzed each of the states in the United States to evaluate their levels of pollution. The term pollution covers a lot of territory including air, water, earth, recycling efforts, fossil fuel energy use, etc.. The variables that exist can be state-specific as well. Some states have large tracts of land but no real industrial base, therefore they don’t have a need for high level industry requirements. With that said, those same states may rank high in wind turbine but may have the largest quantity of power plants that are coal-fired. 24/7 Wallstreet used an evaluation scale for 49 metric areas. The metric information was gleaned from just about every organization possible, both Federal and not-for-profit. The data used for the analysis was based on 2009-2010, and included thousands of data input information. Illinois: Only 1.6% of the energy used is derived from renewable resources, ranking Illinois as the fourth worst in the nation. Illinois ranks third for consuming the greatest amount of energy. The EPA rated Illinois with the fourth worst score for toxic exposure. The state has a heavy industrial presence which contributed to this poor ranking. Strangely, it is also included as 7th place for their policies on solar energy. Missouri: In attempting to balance or offset scores based on one category over another, the state of Missouri fell to a flat area in every category that was analyzed. It fell in the 28 categories that were ranked and only appeared five times in the upper 25 categories. Missouri holds a rank of 37 in general policy initiatives and for alternative energy in non-hydroelectric it is number 48. Kentucky: This state has a poor performance in almost every category. 43 for the release of cancer-causing chemicals, 44 for the release of developmental toxins and 41 for the release of toxins affecting reproduction. Kentucky is ranked 39 for fossil fuel CO2 emissions. Texas: The state of Texas does excel in some areas, such as their wind energy initiatives and wind farms, however, their performance in many of the polluting categories ranks them on this list. They are at the bottom of the list for fossil fuel CO2 emissions as well as scoring 50 for toxic exposure score from the EPA. Texas is # 47 for waterway release of toxic chemicals, # 39 for the release of reproductive toxic chemicals. Texas produces the largest amount of hazardous waste in the country. Pennsylvania: The state has a history of industries that rank high in the polluting arena. These have historically included steel, coal and natural gas. Pennsylvania ranks # 48 in fossil fuel CO2 emissions, 49 in adding particulates to the air, 49 for general toxic exposure. New Jersey: This is a state that used to be called ‘the armpit of the country’. The toxic dumping in the state was historically notorious and New Jersey was never known for their green reputation. The state ranks # 45 in air particle pollution and # 46 for pollution to the ozone. They have increased their policies on alternative energy but the policies have not equated to actions. New Jersey ranks third to the last for alternative energy generation. Louisiana: The state ranks # 46 in any policies or programs that equate to energy saving and has the sixth lowest budget applied to alternative energy. It ranks incredibly low for their pollution to water and is in the lowest five states for the release of carcinogens in water pollution along with birth defect chemicals. 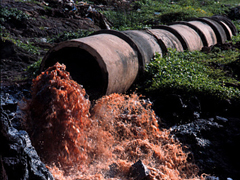 Louisiana is a state that creates the third highest amount of toxic waste annually. West Virginia: While West Virginia has a good ranking for the lowest level of energy consumption it ranks low in any policies and actions regarding alternative energy, air and water pollution and overall carbon footprint. The only positive point they have is that the state is generating three quarters of a million mw of wind energy on an annual basis and does rank as the # 19 in this category. Indiana: This is a coal state and houses the biggest coal power plant in the nation. There is a tie with Ohio in have the least percentage use of renewable energy sources. Indiana also has a lot of pollution problems, releasing the largest amount of water toxic chemicals. Ohio: Ohio is number 5 in overall energy consumption (mostly from coal) with hardly any of their energy being met with alternative energy solutions. While they tie with Indiana on the topic of the least renewable energy sources and highest consumption, they also rank # 47 for fossil fuel CO2 emission, 46 for general exposure in toxins and are next to last for the largest quantity of hazardous waste violations since the year 2000. Posted on February 3rd under Global Ecology, Saving Our Planet.